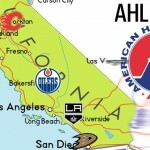 San Jose, Calif. – The Edmonton Oilers joined American Hockey League (AHL) President David Andrews and four other NHL teams to announce the AHL Board of Governors has formally approved the steps necessary to create a Pacific Division within the AHL beginning with the 2015-16 season. The Anaheim Ducks will purchase the Norfolk Admirals AHL franchise and will relocate it from Norfolk, Va., to San Diego, Calif. The AHL franchise owned by the Calgary Flames will relocate from Glens Falls, N.Y., to Stockton, Calif. 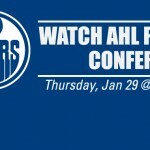 The AHL franchise owned by the Edmonton Oilers will relocate from Oklahoma City, Okla., toBakersfield, Calif. The AHL franchise owned by the Los Angeles Kings will relocate from Manchester, N.H., to Ontario, Calif. The AHL franchise owned by the San Jose Sharks will relocate from Worcester, Mass., to San Jose, Calif.
Oilers President of Hockey Operations Kevin Lowe said, “We want to thank and congratulate the AHL, NHL and our fellow member clubs in making the Pacific Division a reality through hard work and collaboration. The Edmonton Oilers are extremely excited about this new opportunity to enhance our development system and help grow the game of hockey in California. Full division alignments and schedule formats for the 2015-16 season will be determined by the AHL Board of Governors at a later date. Formed in 1936, the American Hockey League serves as the top development league for players in all 30 National Hockey League organizations, as well as coaches, officials, executives, trainers and broadcasters throughout the NHL. More than 88 percent of today’s NHL players are graduates of the American Hockey League and through the years the AHL has been home to more than 100 honored members of the Hockey Hall of Fame.